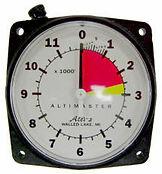 Steve Snyder introduced the Altimaster concept of: 0-12,000' which was founded on the belief that most people are accustomed to reading a clock face, and that a freefall takes about 60 seconds -- one sweep of the second hand. The needle points at the numbers and does not cover them up. The Altimaster II contains a durable mechanism made from temperature compensating metals for minimal friction and precision accuracy with an altitude range of 18,000 feet. Available with feet or metric face. A unique version of the Altimaster II was created especially for President Bush.